Special Exhibit 2018 "The Women of Boal"
​The most influential woman artists, and subjects are displayed in the Conservatory. The exhibit tells a story of perseverance of hardships, and the women who changed history. These women include, Madame De Genlis, Empress Eugenie and Anne of Brittany. This exhibit is only available until the end of the season. 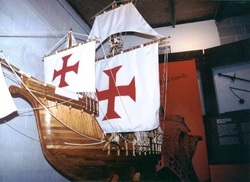 This exhibit contains a scale model of the Santa Maria, the Admiral's Desk of Christopher Columbus and other memorabilia related to Columbus and his travels. The exhibit contains a beautifully restored 1850's stage coach, a buckboard buggy, old farming tools, the 1816 accounts book from David Boal's tavern, and many more farm and kitchen implements. The Armory contains a large collection of swords, rifles, and pistols from the Middle Ages through World War I. This includes David Boal's Pennsylvania long rifle from 1802 and Captain John Boal's officer's saber from the Civil War.